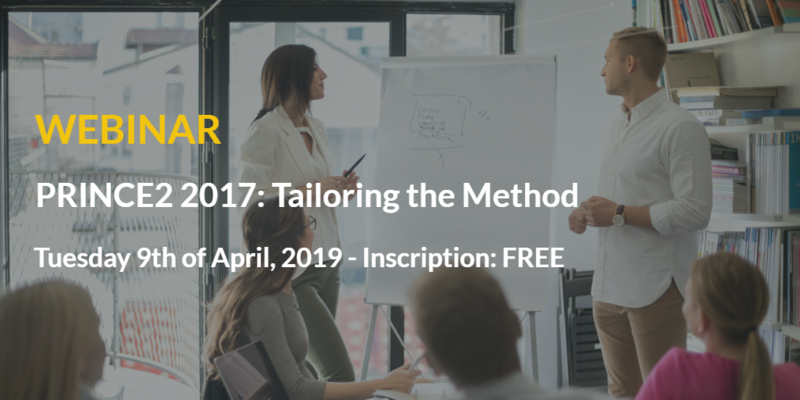 Home/PRINCE2 2017: Tailoring the Method – New Webinar in German! PRINCE2 2017: Tailoring the Method – New Webinar in German! What does it mean ‘tailoring’? Would you like to read this chapter? Do it now! Download the free document! What about ‘PRINCE2 and Tailoring’? “Tailoring is about getting the right balance between a laissez-faire approach and over-engineering your project management. It’s about using your skills and experience to adapt PRINCE2 to your project’s particular circumstances” (PRINCE2 2017 Update – tailoring gets better results, Axelos). Tailoring can be applied to processes, themes, roles, management products and terminology: tailoring is concerned with the appropriate use of PRINCE2 in any given situation. This 30 minutes-webinar will show you how to apply PRINCE2 for very simple projects (“PRINCE2 on A4”) and for bigger projects that will require a more complex PRINCE2 tailoring. Do you need a basic understanding of PRINCE2? Or do you need a Full PRINCE2 Course? Why should you attend this webinar on PRINCE2? After following this webinar you will understand what to look out for and how to adapt your approach to the scale and complexity of your project, without compromising your ability to manage it. This helps you to make a conscious choice of which project management elements to simplify and which elaborate, to be able to confront projects of different size and complexity. Do you want to have a practical insight in tailoring PRINCE2? If you’d like to have more information about this webinar or QRPInternational courses, please contact-us and we will reply you with a mail or call as soon as possible.